Liberals, progressives and the media have been wringing their hands about Donald Trump since he announced he was running for president in June 2015. At first, Democrats said Trump could not get the nomination. Then they rooted for him to get the nomination because he would be the “easiest to beat.” Then they confidently expected a Hillary Clinton victory. Once Trump won, Democrats coalesced around a silent coup d’état involving false accusations about Russian collusion and the prospects of removal from office under the 25th Amendment or impeachment. At every turn, the Democrats have been wrong. Trump has survived all efforts to remove him from office. He has piled up an impressive record of accomplishments including tax cuts, regulatory reform and improved trade deals. Despite all of the opposition angst, Trump is incredibly easy to understand. He means what he says and he’s willing to act on it. Washington insiders are so accustomed to politicians who say one thing and do another they don’t know how to analyze a president who actually follows through with his announcements. 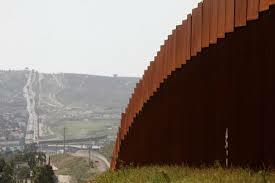 The latest example is Trump’s order to close the border with Mexico because of Mexico’s failure to stop waves of immigrants from Central America and Mexico’s inability to control its side of the U.S. border. This article reports that Trump is now preparing to shut the U.S. border with Mexico at key ports of entry from El Paso to San Diego. When Trump first announced this possibility last week, most media types dismissed it as hyperbole and something that would never happen. Once again, they are caught off guard. As I said, Trump means what he says. D.C. Beltway types who still don’t understand this should try a different line of work.